Do you have a startup business or are you planning to launch one soon? Then, it is clever to get conversant with SWOT Analysis. Being an amateur in the business, you must be thinking what exactly it is. 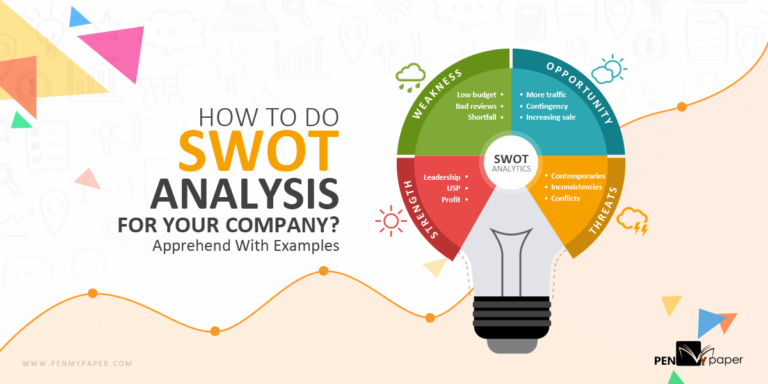 This blog guides you with all the practical details of SWOT analysis with example – from definition to mechanism, it has everything! Convention says, this analytical tool is an entrepreneur’s best friend. Penetrating deep into your business model, it finds such stats that even you have no idea of. To take a long, hard glance at your organization, there can never be a better way than this. Before getting into the tips and techniques of this analysis, comprehend the fundamentals. SWOT is an analytical framework that aids in evaluating a company’s competitive stand in the market. Using this technique, you can determine the key attributes of your firm, be it forte or risk. The acronym SWOT defines Strengths, Weaknesses, Opportunities, and Threats. Be it an entire organization or individual departments, this technique is known to identify the growth trajectories and success standards. Also, it judges any particular project’s current alignment in accordance to its initial projections. Veterans believe, “If you are doing it, do it right!” However, some startup entrepreneurs take business analysis quite informally resulting in delayed-growth or no-growth. To avoid this mistake, you must perform the investigation in best possible manner using SWOT framework. It succors in eliminating your company’s weaknesses by adeptly capitalizing the strengths. After the recent SWOT analysis of Walmart, the internal experts beautifully played with the strengths and opportunities to win over threats and weaknesses. Eventually, it favored them to own five times extra retail space than its three significant rivals. In 2018, to everyone’s expectation, Walmart has been listed as the “24th most valuable brand in the world” by Forbes. If you consider Walmart as your inspiration and wish to perform SWOT analysis in your small business, identify the outline first. Strengths (positive aspects): As you fathom from the term, this component highlights company’s strong points. It addresses to the finest factors responsible for your company’s prominence in the industry or your project’s excellent worldwide performance. Typically, you get answer to the most common question – Which are those internal positive factors of your business that offers a competitive benefit? Mostly, there are references to intangible concepts like good attributes of your brand, unique selling proposition of a specific product line, adept human resources, strong leadership capability of the managers, experiences of the workers, their knowledge, background and more, similar to these. But, it includes tangible findings, as well, such as proficient engineering team, company’s capital, yearly credits, current customer base, and so on. In 2018, Apple SWOT analysis have discovered five noteworthy strengths in favor of the brand that, till today, the competitors are trying to imitate. Weaknesses (negative aspects): Having a clear idea about your company’s weaknesses is the ideal way to work on them. SWOT technique allows you to perform a critical analysis on the vulnerabilities and flaws of your business. Once you have the list ready, it becomes easier to erase off the factors that has been holding back your project and business growth for long. Weakness refers to the negative aspects that are elusive, like financial crisis, shortage of resource, scarcity in members, or something like undefined USP. Also, this tool finds out the points where your firm is lagging behind in correspondence to other contemporary companies. Starbucks SWOT Analysis, for the year 2018, has been a much talked about event for its unusual weaknesses, defined by the experts. But, they have wittily operated on their robustness to win over the drawbacks and limitations. Opportunities (positive aspects): These are, undoubtedly, the external striking factors that highlight the paths in which your organization is likely to prosper. It talks about a company’s growth and the course to achieve. Precisely, this segment of the analysis opens up windows for a better future. On evaluating the opportunities you get ideas on improving the company’s sale-counts, mission statement, year-end revenue and more stuffs like that. Experts brainstorm innovative perceptions, which expose the brand to new market, based on this analysis report. The year 2018 has seen multiple exciting SWOT analytical results from big brands like Walmart, Apple, Starbucks and more. Experts in each of these organizations know the tricks of the trade and well-utilized their opportunities to upsurge yearly profit. Threats (negative aspects): Likewise the weaknesses, it essential for every company to have a prior idea about the external negative factors. Once you know the risks, it is possible to solve them or at least prepare for them. On applying SWOT technique, you get the full list of the recent threats to your business. This part of analysis explores budgetary risks, threats from digital platform, budding competitors, alterations in regulatory laws, and every other virtual aspects that have potentials to jeopardize the future of your business. After 2018 McDonalds SWOT analysis, there has been a new record set by them. As per the spokesperson, McDonalds’ threats, actually, work in their favor by motivating them to emerge stronger and bigger. For every small business, dreaming of becoming competitors to bigger names, it is essential to conduct SWOT Analysis. Though there are distinct ways to perform the analysis, initially you have to find answers to some critical questions. In which sectors your brand is better than the contemporaries? What are your most appreciated brand attributes? Which resources make you stand ahead of the crowd? How do you retain enduring customer base? On which factors your company receives negative feedbacks? In which resources your brand is lagging behind the competitors? Which products are highly disliked by your consumers? What make your client cancel of return? In which aspects your business can improve? What are the existing opportunities that you can take advantage of? Is your firm at a favorable state with the current market environment? How can your brand attribute enhance the ongoing prospect? How to encourage traffic and gain resource? Who are your contemporary potential competitors? Which of the factors are uncontrollable and can put your business at risk? What can threaten your both online and offline marketing effort? Is there any new technology or product in market that makes your service obsolete? Has the recent shifts in economy and law affected your firm? To derive answers to these questions, you need strategic planning. Well, if you have experts on board, then seek assistance from them otherwise, here’s an excellent solution for you. PenMyPaper, being in the business for long, comprehends the perfect strategies for smoothly conducting a SWOT Analysis. We have a team of experts, who initiate with understanding your business and follows a unique approach to get the finest result. On availing our service, you need not to worry about the tactics and plans as we craft it for you in accordance with your business. Get the job done at most economic costs. Get in touch for free consultation!